On the TI Discussion Forum, someone asked if Breaststroke is really easier to swim than Butterfly. Most people think it is. He felt as if the energy cost was higher in Breaststroke. 1) Focus more on streamlining than propelling. In both strokes, the typical swimmer gives most of his attention to pulling and kicking. Instead, think mainly about doing what it takes to put your body in a streamlined position at the conclusion of each stroke. “Streamlined” means elongated and sleek, with head hanging between shoulders. 2) Spend more time in that streamlined position, most of it below the surface. Spend less time in any non-streamlined position. We’re talking about nanosecond adjustments here, but small changes in timing make a big difference. 3) While you focus on holding a streamlined position, let gravity take you down . . . until you feel buoyancy has become the stronger force. Let buoyancy return you to the surface. This is far more economical than diving-and-climbing. 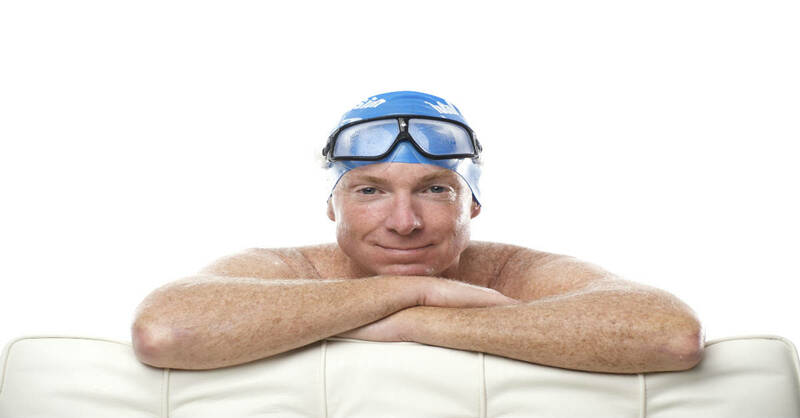 4) Start the next stroke just as you feel buoyancy – working mainly without much help from you – is about to take you back through the surface. Do just enoughwith your hands to help your head clear the surface for a breath. 5) About that breath: Keep your head as stable and neutral as possible – and your chin in the water – as you breathe. Find considerable detail and step-by-step suggestions for building skill, speed and endurance (i.e. the distance you can swim WITHOUT fatigue) in the book Extraordinary Swimming. For visual learning aids, there are the DVDs BetterFlyfor Every Body and Breaststroke for Every Body. I am glad and proud that I have been doing this for the entire winter. Due to a back injury, I have been forced (and I still am) to swim in different styles other than crowl. I have improved much in my breakstoke by just doing all you are explaining here. I try to spent more and more time in that elongated position and it is amazing how you can keep improving that position every day. The less we offer places of friction, the longer we can slide under the water with less effort in every stroke. what I have learn is on fly put your head in the water before you bring your arms around. Allows for you not to get tried has fast and focus on using your abs. Over using your back muscles.